Should We Launch a Kid to Space? 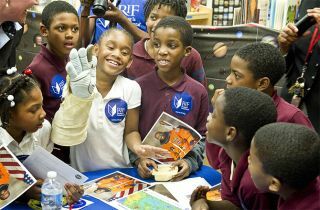 Students from Ferebee-Hope Elementary School in Washington, D.C. try on a spacesuit glove at a space education event in 2011. On Aug. 6, 1961, cosmonaut Gherman Titov became the second person ever to orbit the Earth. He zipped around the planet 17 times aboard the Soviet Union's Vostok 2 spacecraft and then touched down on Aug. 7. Titov was 25 at the time. About 550 other people have slipped Earth's surly bonds since Titov's trip, but not one of them has been younger. Indeed, NASA has never even launched a 20-something; the youngest American astronaut, Sally Ride, was 32 when she lifted off on her first space shuttle mission, in June 1983. Though the first child astronaut surely would get a lot of media attention, Mongo thinks his or her mission would be much more than a publicity stunt. "By letting a kid go to space, we will inspire an entire generation of space explorers," Mongo said late last month at the Dent:Space conference in San Francisco. "If we solve space for kids, they will solve the future for us." Mongo spends a lot of time giving presentations to schoolkids, especially in underserved neighborhoods, both in the United States and in other nations, such as Cuba and Jamaica. He encourages these kids to pursue careers in astronautics and tells them that the jobs of tomorrow will be in space. When the children learn that only grown-ups have been to space so far, the common response is "outrage," Mongo said. "It's like I've stripped away all their civil rights on the spot," he said. "They literally jump out of their seats and throw their arms up, like this. It happens all the time." "We let a kid fly in an airplane, and he defeated the Nazis," Mongo said. "What's going to happen when we put a kid in a rocket ship?" So who should the first child astronaut be? To have the greatest impact, Mongo said, he or she should be a smart, motivated kid from a humble background — "I'm not talking about some silver-spoon kids," he said — and fly on a mission to Earth orbit rather than a brief jaunt to suborbital space. He thinks this will happen soon. Whenever that first child lifts off, there will be a huge surge of interest in spaceflight and exploration, Mongo said. "When a kid goes to space, kids all over the world will start bugging their parents, teachers, everybody: 'Why not me?'" he told Space.com.